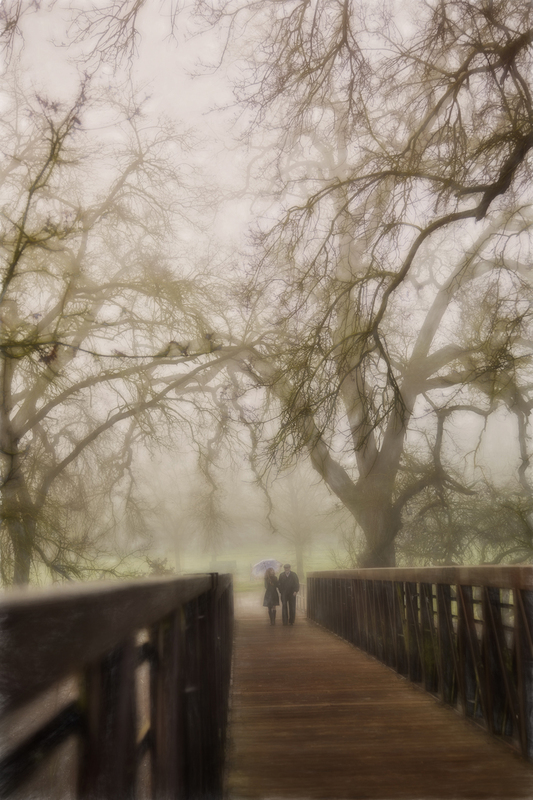 Not long ago I posted some pictures I took on a foggy morning at Scenic Oak Park. Shortly after that Anna contacted me and asked if I would be able to recreate the picture of the bridge but with her and Brad in it. We set a date, and yes, I wished for fog. I hate fog, and I can honestly say that this was the first time in my life I really, really wanted it! The morning of our appointment came and I got my wish. It was foggy. And cold. We met at 8:00 in the morning and I snapped a few pictures before returning home for a hot cup of coffee! Anna wanted them to be in the distance, not necessarily recognizable. I think we captured the look she was after. We love the picture Judy. can’t wait to see it in our home. You are the best! oooooooo that is beautiful! That’s going to make a great piece over a mantle. This is one of my favorites you’ve taken. It’s perfect! Gorgeous and so clever! Like an oil painting.